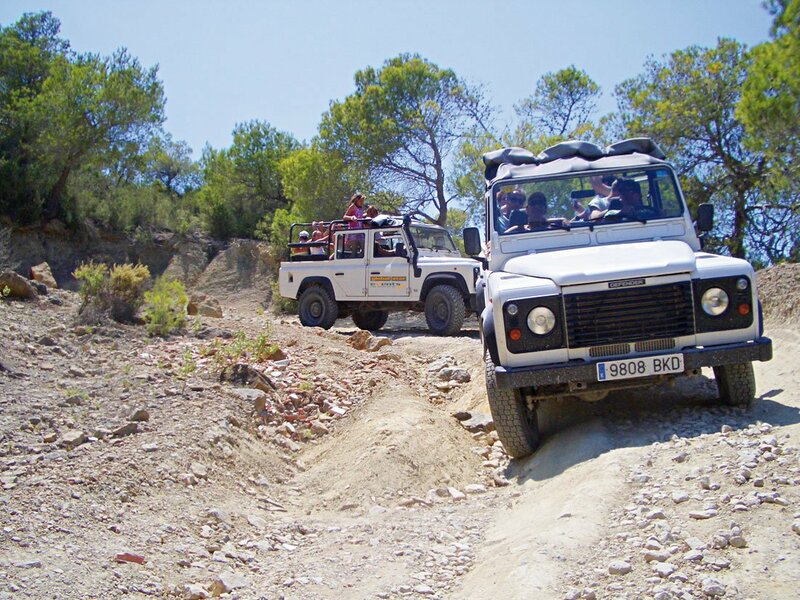 Discover the true Ibiza on this guided safari that takes you through the rough terrain of the north, east and west of Ibiza, past scenery only accessible in a jeep. Thank you so much for such an enjoyable and educational day! We learnt so much about Ibiza and saw some of the best views of the coast, simply stunning! The guide we had was pleasant and had so much knowledge and made the whole day great fun. Lunch was delicious, lovely little restaurant. The day ended with a swim at Benirras beach ,then back to the hotel. I highly recommend this excursion , cannot fault it.Thanks to all of you and see you again soon,Vicki and Luke. What a fantastic day we had on our jeep safari. We were picked up from our hotel at 9:45 in S.E. and then called into Cala Llonga to pick up another couple and a mother and daughter and we were on our way. Our driver Patrick was friendly, courteous, professional, funny and educational for the duration of the trip. We were travelling on our own i.e. not as part of a convoy, and this probably made it more personable. We were very quickly taken off the main road onto side roads but alongside some of the most amazing scenery you will see anywhere and perhaps at odds with a lot of perceptions of Ibiza. The style of the trip was that Patrick would drive to a good vantage point and talk about the history and ecology of the place before moving on. This meant a bumpy ride along roads of dubious quality but this all added to the fun. We were with a really nice group of people which also adds to the day. We basically set off in a northerly direction cross country before stopping for lunch as part of the cost of the trip. Apologies that I cant remember the name of the restaurant, but on the day we went we were given a huge chicken salad, quality food in a quality setting. Drinks were extra, but that's fair enough. Travelling via some excellent viewing points, we eventually reached the lovely beach of Benarris for a quick dip look around. After this we began the journey back to our resorts arriving back at about 17:00. The day was perfect, we met some lovely people, learned a lot, ate well and with the occasional rush of adrenaline thrown in for free. Our guide Patrick was superb and helped make it the best day of our holiday. It was one of our best day's on Ibiza. So much fun and great views. Places you don't find on your own. The guides knew a lot about flora and fauna on the island. And also about the history. Annet was a great tourguide! I really recommend this trip! It was our fortune that we had booked Ibiza Jeep Safari. It was such a wonderful day spent with exploring the beauty of Ibiza Island which was not possible through any other transport medium. The guide has a wide knowledge of the history, geography, flora and fauna of the island. Overall the day was one that is one of best day to remember in our life. I recommend everyone to go for a Jeep Safari. This was a great way for the 3 of us to explore other parts of the island. The guide was excellent, the locations beautiful, and the lunch had the best tasting orange I have ever eaten! Perhaps because so much of the fruit in the US where I live is fairly tasteless.